Went with a loved one to the local hospital for x-rays and took the opportunity to have a scribble while I waited. It’s very selfish but hospital waiting rooms are good places for sketching as people are often very preoccupied and don’t notice you. 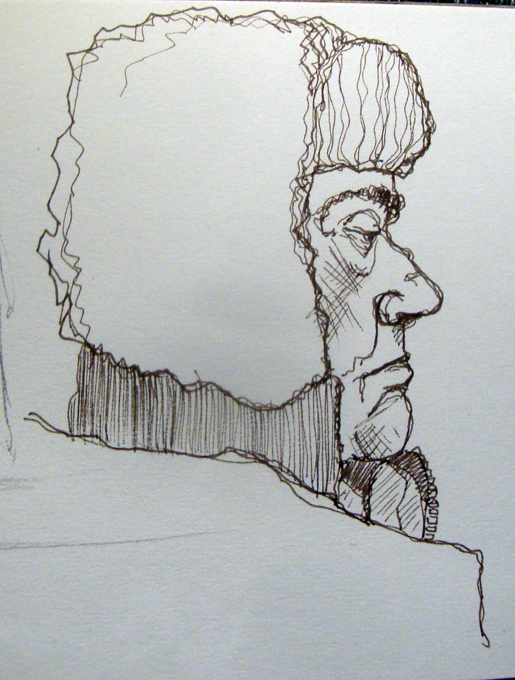 This elderly man was dressed for the winter and kept his fabulous fake fur hat firmly on his head for the duration. 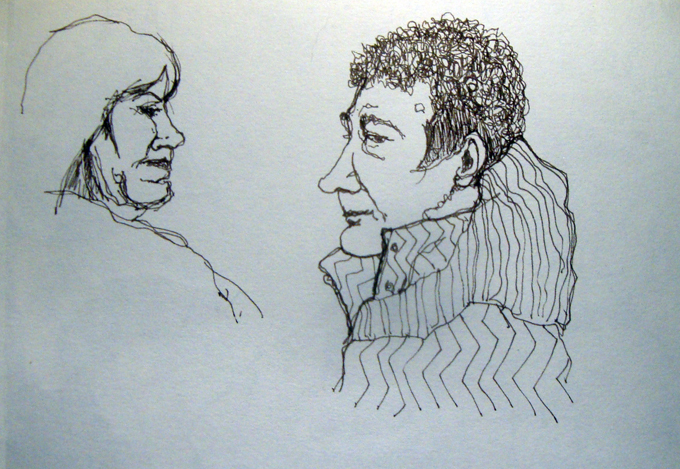 I used Faber Castell Pitt drawing pens, sizes S and F into my A5 Tate Gallery sketchbook. We weren’t there long. The NHS at its best is fantastic. Just time for a quick blog tonight. 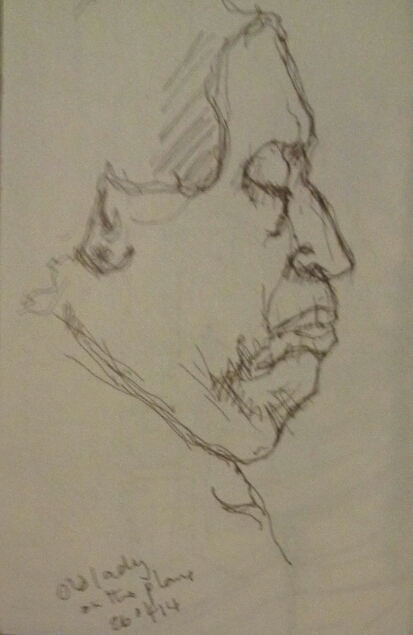 Husb and I went to an outdoor screening of Alfred Hitchcock’s ‘Psycho’ on the street beach this evening and just got back so I did a speedy scribble of an old lady’s head, took me 4 minutes. And now to bed. Exciting day tomorrow. It’s what I’ve been practicing for. This is the very last drawing I did on my Pakistan residency. 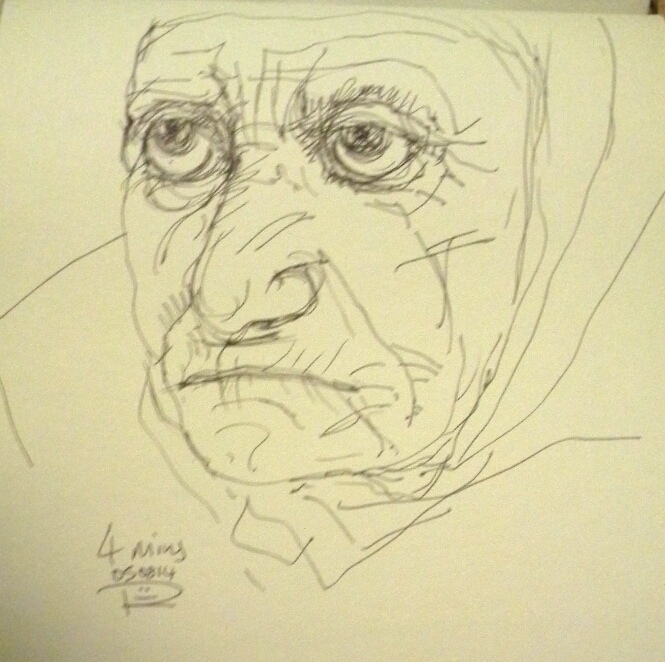 I drew this elderly lady as she slept on the plane journey on the way back from Kuwait, into my little A6 sketchbook using a Faber Castell Pitt drawing pen size S.
The residency was supported by Wales Arts International and Arts Council Wales. I’ve been out and about and stuffing too much food for the past two days to do any drawing and I’m so stuffed I’m too lazy to sketch. So here’s a recent drawing, based on one in my sketchbook and redrawn over a solvent transfer print I made from an original digital photograph. It’s one of the collection in my current exhibition in The Brunswick which runs until early March. I like focussing on older people because they so rarely figure in contemporary art. Our population is ageing, art should reflect society, in my opinion. 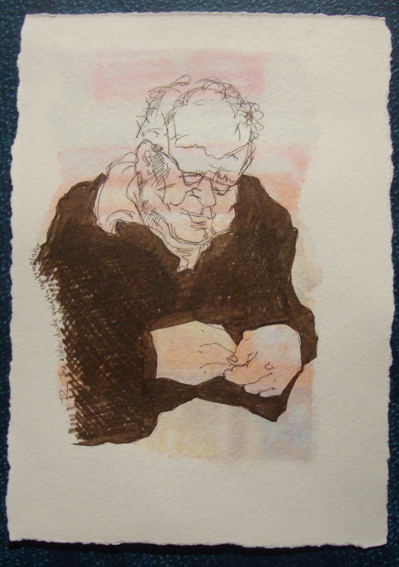 I drew this chap in a hospital waiting room, while he was quietly contemplating his hands. It’s been a tiring week but after tomorrow I’ll be able to have a bit of a break from arty stuff and enjoy some time off. On Wednesday evening I was at the opening of a group show I’m in at The Brunswick. It’s been a long haul as I have work in 2 other exhibitions at the moment and it’s been a lot of effort to get all the pieces finished and framed. But it’s all done now. Husb and I spent today with 4 generations of my family at Margam Park where three of the generations were running in the 1k funrun to raise funds for the Royal Naval Lifeboat Institution (RNLI). It’s a really good cause as the lifeboat service is voluntary and relies on public generosity to carry out its work. Unfortunately I couldn’t run becaue my knees are wrecked, too many years tearing around on motorbikes in all weathers in a miniskirt and fishnet tights! If I was a horse, they’d shoot me. It’s lovely to be part of a 4-generation family. I think it’s good for children to relate to older relatives who cover so much history between them and it’s delightful to see the very elderly and very young together. 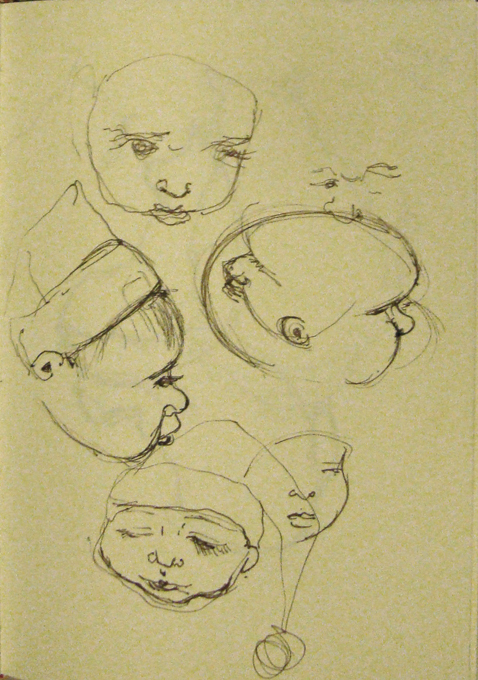 Scribbled in haste into my A5 clothbound sketchbook with a Faber Castell Pitt drawing pen size F in sepia. 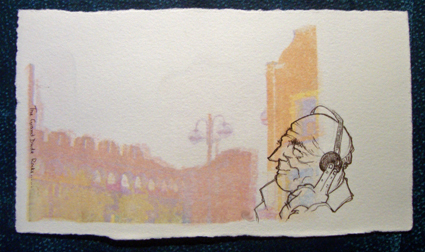 Sometimes I only have a minute or two to scribble someone in the street. Here’s an elderly man sitting outside Starvin’ Jacks the other day. I grabbed my sketchbook and did my thing. About a minute and a half before he moved on. You never know how long you have so all the relevant lines have to be done very quickly and that helps train you in spotting what’s necessary and what can be ditched. There’s no substitute for speed drawing IMHO. Faber Castell Pitt pen size F into my A5 cloth bound Laura Ashley sketchbook. Husb took me for lunch today – at our local chip shop cafe. Last of the big spenders! 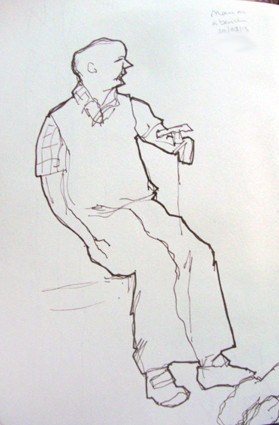 Anyway, we were just about the youngest people in there (and we’re middle aged) and I scribbled this eldely man while I waited for my battered fish and chips, with a diet coke- must watch the calories. I did the sketch in about a minute; that sort of timescale forces you to focus on what’s crucial. It was a lovely evening so we went down the allotment for a spot of digging. I love digging. I get into the zone and meditate. I’ve been making comfrey tea liquid fertiliser and I doused my little leeks with it. It stinks and now I smell horrible. Luckily Husb has a cold. Feeling better day by day and went out for lunch with Husb to a local cafe, which does really nice home made food. 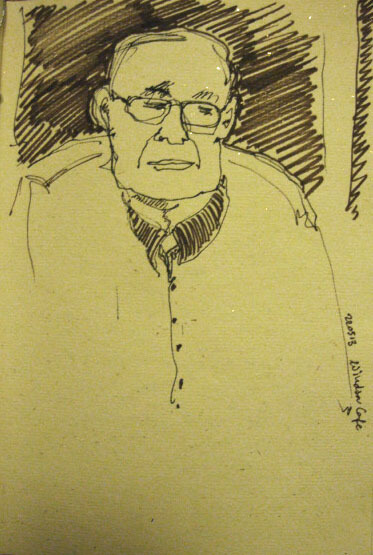 I looked around for someone to scribble and saw this very elderly man, in his eighties, dining with some friends. His hair, although thin, was down almost to his shoulders and over his dapper striped shirt and tie was a rockin’ leather waistcoat. Cool. It’s been a difficult few months, with the worst summer in living memory and serious illness and deaths of people dear to us but ….. fingers crossed…… things seem to have calmed down a bit and last Sunday we spend a delightful afternoon in the unexpectedly warm weather, visiting Limeslade with an elderly relative. We had ice cream in the lovely old Fortes cafe and sat and watched the sea crashing over the rocks in the sunshine. Gorgeous. 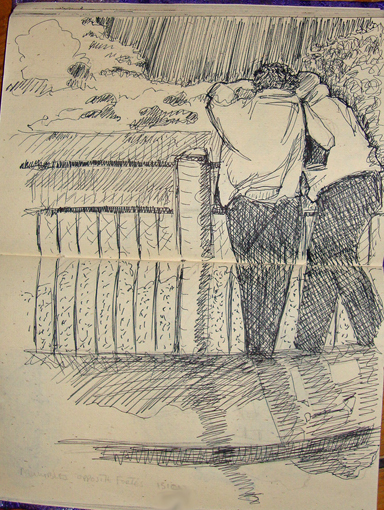 I scribbled this couple across the road from us, engrossed in looking at the view. I don’t find it easy to draw landscape; I concentrate on making marks and hope for the best. 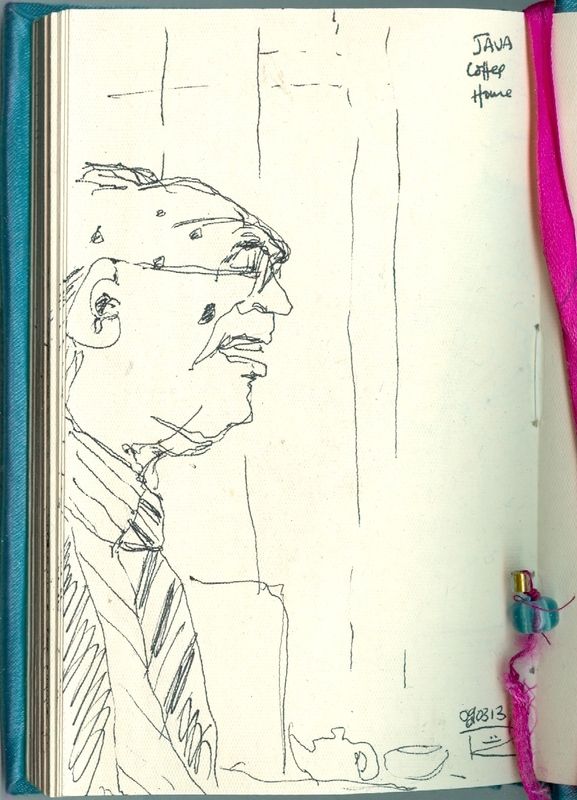 I used my favourite Pilot Hi-Techpoint V5 pen into my A5 recycled sari sketchbook, used across the two pages.